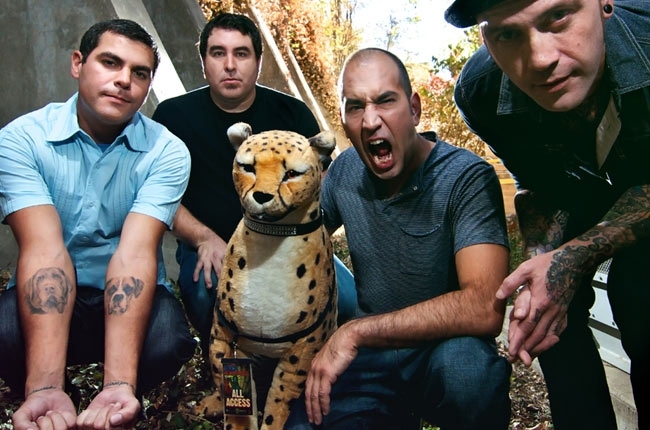 American rock band Alien Ant Farm will return to Los Angeles for another exciting performance. The alternative metal group will take the stage at Whisky A Go Go on Saturday, March 23rd. They will receive support from Blaxmyth, Slant, Pandemic Unleashed, Slave To Humanity, and Raising The Flame. General admission tickets for the show will be priced at $25 with table packages ranging from $100 to $500. Initial sounds will begin at 7:00 PM, with doors opening at the same time. The show will be open to all ages. Mike Cosgrove (drums, percussion), Terry Corso (lead guitar, backing vocals), and Tim Peugh (bass guitar, backing vocals). The group is commonly known for their nu metal cover of the iconic track Smooth Criminal by Michael Jackson. In 2001, the track peaked at number one on Billboard’s alternative songs charts. The band has accumulated five albums in their discography over the years and have sold around five million copies globally. While being commonly known for their Smooth Criminal cover, Alien Ant Farm have far more to offer. With upbeat tracks like These Days and Movies, the group is anticipated to put on an electrifying show.